None of us wants to be sidelined, stuck, shamed, or silenced. But the difficulties of life have a way of putting us in a corner, and we don't know how to move forward. We see brokenness in our communities, our relationships, and our spirits. It's so easy to blame ourselves or our circumstances, to get bogged down in discouragement and toxic thinking. But that's not what we were meant for, and that's not how God wants us to live. Leeana Tankersley has good news if you're struggling: each new day is an opportunity to begin again. In her warm tone and with her signature humor she offers 100 short readings to encourage and motivate you to begin again in your relationships with God, your family, your friends, and yourself. Because there is always a hand reaching toward you, there is always grace available, and there is always a chance to begin again. Leeana Tankersley is the author of five books, including Begin Again and Brazen, and holds English degrees from Liberty University and West Virginia University. Leeana's writing has been featured in the Huffington Post, cnn.com, incourage.me, and aholyexperience.com. She is a regular contributor to MOPS, both as a writer and speaker. Leeana and her three kids currently call Virginia home. Learn more at www.leeanatankersley.com. 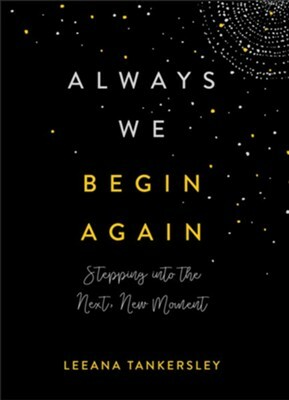 I'm the author/artist and I want to review Always We Begin Again: Stepping into the Next, New Moment - eBook.